One biotechnology player that's starting to trend within range of triggering a near-term breakout trade is CytRx (CYTR), which is a research and development company specializing in oncology. This stock has been on fire over the last three months, with shares up a whopping 175%. If you take a look at the chart for CytRx, you'll notice that this stock has been uptrending over the last month and change, with shares moving higher from its low of $4.28 to its recent high of $8.24 a share. During that uptrend, shares of CYTR have been making mostly higher lows and higher highs, which is bullish technical price action. 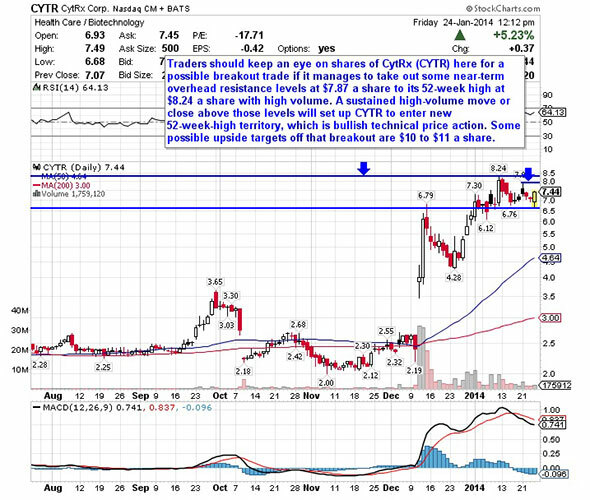 That move has now pushed shares of CYTR within range of triggering a near-term breakout trade. Traders should now look for long-biased trades in CYTR if it manages to break out above some near-term overhead resistance levels at $7.87 a share to its 52-week high at $8.24 a share with high volume. Look for a sustained move or close above those levels with volume that hits near or above its three-month average volume of 3.40 million shares. If that breakout hits soon, then CYTR will set up to enter new 52-week-high territory, which is bullish technical price action. Some possible upside targets off that breakout are $10 to $11 a share. Traders can look to buy CYTR off any weakness to anticipate that breakout and simply use a stop that sits right around some key near-term support levels at $6.76 or at $6.12 a share. One can also buy CYTR off strength once it starts to take out those breakout levels with volume and then simply use a stop that sits a comfortable percentage from your entry point. A network communications player that's starting to trend within range of triggering a near-term breakout trade is Gigamon (GIMO), which designs, develops and sells products and services that provide customers visibility and control of network traffic. This stock has been uptrending a bit over the last six months, with shares up 9%. If you take a look at the chart for Gigamon, you'll notice that this has stock has recently formed a double bottom chart pattern at $28.12 to $28.22 a share right around its 50-day moving average of $28.78 a share. Shares of GIMO are displaying some relative strength today with the stock trending modestly higher as the market sells off considerably. 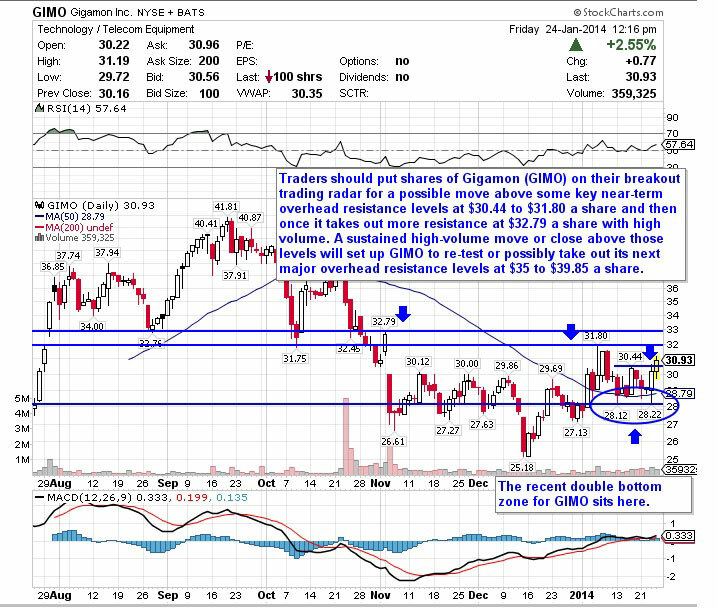 This relative strength is starting to push shares of GIMO within range of triggering a near-term breakout trade. Traders should now look for long-biased trades in GIMO if it manages to break out above some key near-term overhead resistance levels at $30.44 to $31.80 a share and then once it takes out more resistance at $32.79 a share with high volume. Look for a sustained move or close above those levels with volume that hits near or above its three-month average action of 379,326 shares. If that breakout triggers soon, then GIMO will set up to re-test or possibly take out its next major overhead resistance levels at $35 to $39.85 a share. Traders can look to buy GIMO off any weakness to anticipate that breakout and simply use a stop that sits right below those double bottom levels at $28.22 to $28.12 a share. One could also buy GIMO off strength once it starts to take out those breakout levels with volume and then simply use a stop that sits a comfortable percentage from your entry point. Another specialty retail player that's starting to trend within range of triggering a big breakout trade is Mecox Lane (MCOX), which engages in the design and sale of apparel, accessories and home and healthcare products through its online platform and stores in the People's Republic of China. This stock is off to a decent start in 2014, with shares up just over 14%. If you take a look at the chart for Mecox Lane, you'll notice that this stock has been trending sideways and consolidating for the last four months and change, with shares moving between $3.10 on the downside and $4.85 on the upside. Shares of MCOX have just started to trend back above both its 50-day and 200-day moving averages, which is bullish technical price action. That move has started to push shares of MCOX within range of triggering a big breakout trade above the upper-end of its recent sideways trading chart pattern. 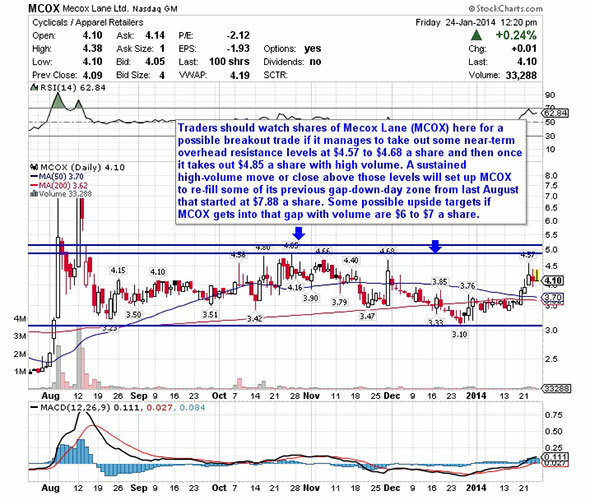 Traders should now look for long-biased trades in MCOX if it manages to break out above some near-term overhead resistance levels at $4.57 to $4.68 a share and then once it takes out $4.85 a share with high volume. Look for a sustained move or close above those levels with volume that hits near or above its three-month average action of 39,563 shares. If that breakout triggers soon, then MCOX will set up to re-fill some of its previous gap-down-day zone from last August that started at $7.88 a share. Some possible upside targets if MCOX gets into that gap with volume are $6 to $7 a share. Traders can look to buy MCOX off any weakness to anticipate that breakout and simply use a stop that sits just below its 200-day moving average of $3.62 a share or around $3.30 a share. One can also buy MCOX off strength once it starts to take out those breakout levels with volume and then simply use a stop that sits a comfortable percentage from your entry point. Another stock that's starting to move within range of triggering a big breakout trade is Coldwater Creek (CWTR), which operates as a multi-channel specialty retailer of women's apparel, jewelry, and accessories in the U.S. This stock has been hammered by the sellers over the last three months, with shares down sharply by 33%. If you look at the chart for Goldwater Creek, you'll notice that this stock has recently formed a double bottom chart pattern at 65 cents to 67 cents per share. Shares of CWTR are now starting to bounce off those support levels and the stock is showing relative strength today in a big down market. That move is beginning to push shares of CWTR within range of triggering a big breakout trade above some key near-term overhead resistance levels. Traders should now look for long-biased trades in CWTR if it manages to break out above some near-term overhead resistance levels at 82 to 84 cents per share with high volume. Look for a sustained move or close above those levels with volume that hits near or above its three-month average action of 230,405 shares. 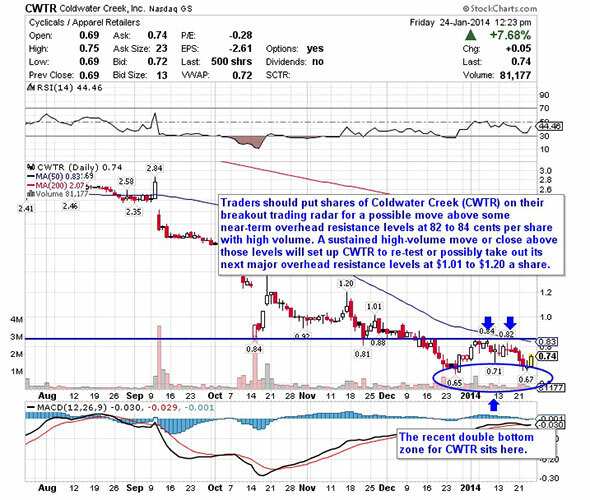 If that breakout hits soon, then CWTR will set up to re-test or possibly take out its next major overhead resistance levels at $1.01 to $1.20 a share. Traders can look to buy CWTR off any weakness to anticipate that breakout and simply use a stop that sits right around those double bottom support zones at 67 to 65 cents per share. One can also buy CWTR off strength once it starts to clear those breakout levels with volume and then simply use a stop that sits a comfortable percentage from your entry point. My final breakout trading prospect is technology player The9 Limited (NCTY), which engages in the development and operation of online games and Internet related businesses in the People's Republic of China. This stock has been under pressure by the bears over the last six months, with shares off sharply by 30%. If you look at the chart for The9 Limited, you'll notice that this stock is bouncing notably higher today right above its 50-day moving average of $2.43 a share with strong upside volume. Volume so far on Friday has registered over 170,000 shares, which is well above its three-month average action of 44,524 shares. This bounce is starting to push shares of NCTY within range of triggering a major breakout trade above some near-term overhead resistance levels. Traders should now look for long-biased trades in NCTY if it manages to break out above some near-term overhead resistance levels at $2.67 to $2.80 a share and then once it takes out its 200-day moving average of $2.91 a share with high volume. Look for a sustained move or close above those levels with volume that hits near or above its three-month average action of 44,524 shares. 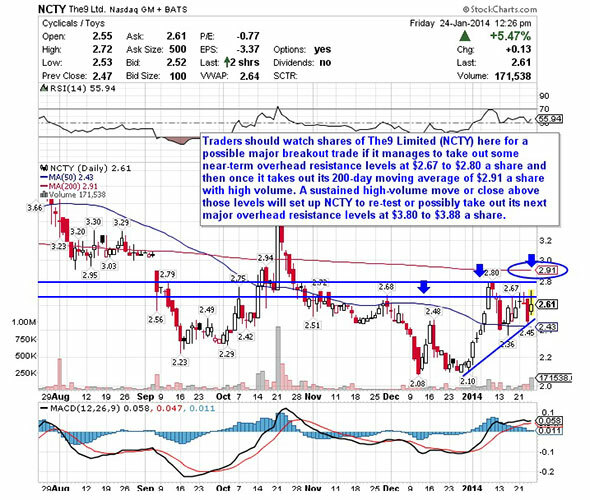 If that breakout triggers soon, then NCTY will set up to re-test or possibly take out its next major overhead resistance levels at $3.80 to $3.88 a share. Traders can look to buy NCTY off any weakness to anticipate that breakout and simply use a stop that sits right below its 50-day at $2.43 a share or near more support at $2.36 a share. One can also buy NCTY off strength once it starts to take out those breakout levels with volume and then simply use a stop that sits a conformable percentage from your entry point.